Review: "Boguslaw Balcerak's Crylord: Blood Of The Prophets" - Sea of Tranquility - The Web Destination for Progressive Music! 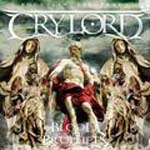 Blood of the Prophets is the latest Lion Music release from Polish guitar shredder Boguslaw Balcerak and his band Crylord. Produced by King Diamond guitarist Andy LaRocque, Blood of the Prophets is a great sounding neo-classic power metal affair, filled with blazing guitar work, symphonic keyboards, sweeping arrangements, and the powerful vocals of the trio of Carsten 'Lizard' Schulz, Goran Edman, and Marc Boals. Considering that the latter two are former members of Yngwie Malmsteen's Rising Force, and Balcerak's penchant for neo-classic metal, you can safely say that much of this CD will have a similar flavor to the work of the legendary Swedish guitar hero. As you have already assumed, there's plenty of fretwork explosions to be found here. Balcerak is a damn fine player, and he drops in a wide assortment of riffs as well as blazing arpeggios thoughout the CD. Thankfully, the arrangements are also keyboard and vocal rich, so it's not an out and out shred fest. Tunes like "Grave of Love", "Bard's Tale" and the amazing title track are memorable for all the right reasons, not just guitar solos. "Warriors Moon" is a powerful symphonic metal track, featuring Edman's soaring pipes, and "The Heretic" is a jaw dropping instrumental featuring some incredible guitar & keyboard exchanges. Perhaps the most compelling track here however is the epic "Valley of the Dead", which brings to mind late 80's Black Sabbath, Dio-era Rainbow, and the early albums of Yngwie Malmsteen. Featuring crushing riffs, orchestral keyboards, and the powerful vocals of Schulz, this one's a real winner and shows another side to the band. Despite some moments where the whole 'neo-classical/symphonic' gets a little tiresome, this is actually a pretty damn solid release from Boguslaw Balcerak's Crylord, and I'd certainly be interested to hear more from this act in the future. Another fine release from the folks at Lion Music.